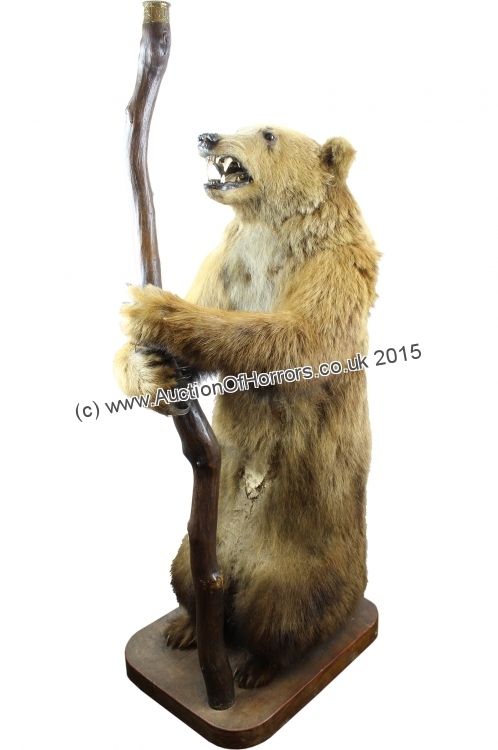 full mount bear with ragged staff, the base on castors for easy movement. 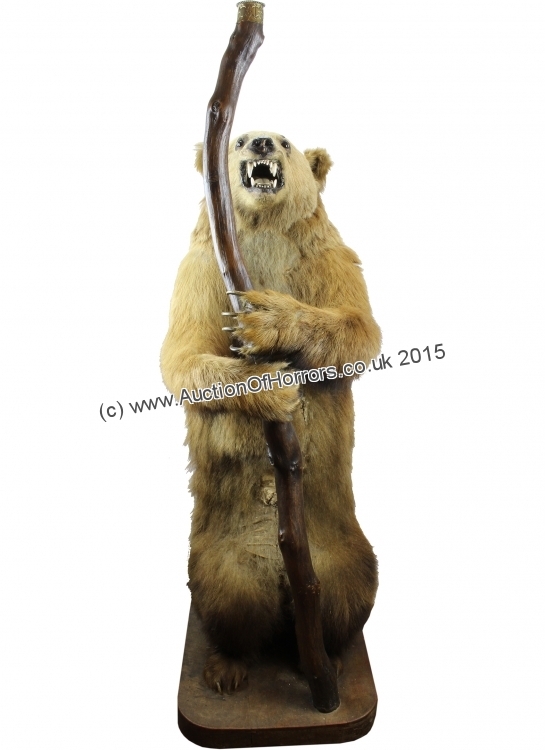 The bear and ragged staff have long been associated with Warwickshire. The origins of these emblems are lost in the distant past, but have been associated with the Earls of Warwick since at least as early as the 14th century. 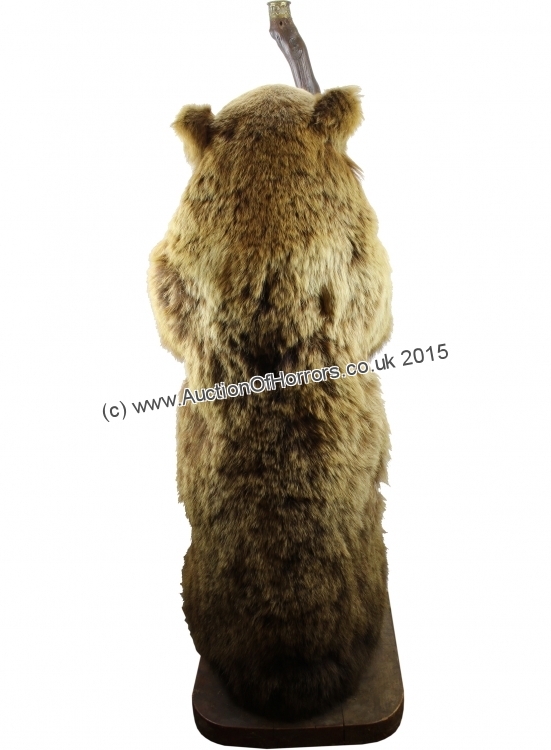 William Dugdale in the 17th century, recalls that the legendary Arthgallus, an Britsh Earl of Warwick and knight of King Arthur&apos;s Round Table, thought that his name came from the Welsh "artos" or bear. He also suggested that the ragged staff was chosen because Morvidus, Earl of Warwick, killed a giant with the broken branch of a tree. These claims cannot be supported and Dugdale was just recalling medieval legends. However, there is no doubt that the bear and the ragged staff were first used by the Beauchamp family, who became Earls of Warwick in 1268, as a badge or mark of identity in to addition to their own coat of arms. At first the emblems seem to have been used independently. In 1387 Thomas Beauchamp II (Earl from 1369 to 1402) owned a bed of black material embroidered with a golden bear and silver staff, which is the earliest known occurrence of the two emblems together. 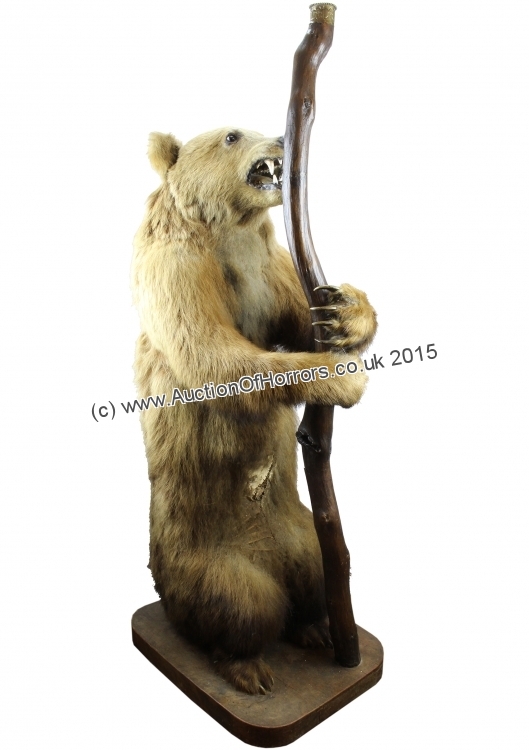 The bear and ragged staff have been used by subsequent holders of the Earldom of Warwick, the Dudleys, the Grevilles and are borne as a crest by the present Earl. Over the centuries they have also come to be associated with the county, and used as a badge 1st Warwickshire Militia regiment and the Warwickshire Constabulary and the Warwickshire County Council obtained the permission to adopt the bear and ragged staff for their common seal in 1907.